IF YOU NEED CUSTOM DESIGNS, WOULD LIKE TO OFFER SPIRIT WEAR FOR YOUR TEAM, CLUB OR SCHOOL OR HAVE ANY QUESTIONS CALL US AT 224-400-9784 or 630-877-1363. BE SURE TO CHECK SIZES BEFORE ORDERING AS ALL ORDERS ARE CUSTOM MADE AND NON-REFUNDABLE. PLEASE ALLOW 14 BUSINESS DAYS FOR ORDERS. NAPERVILLE SPIRIT WEAR RESERVES THE RIGHT TO INTERCHANGE APPAREL BRANDS WHEN ITEMS ARE OUT OF STOCK. 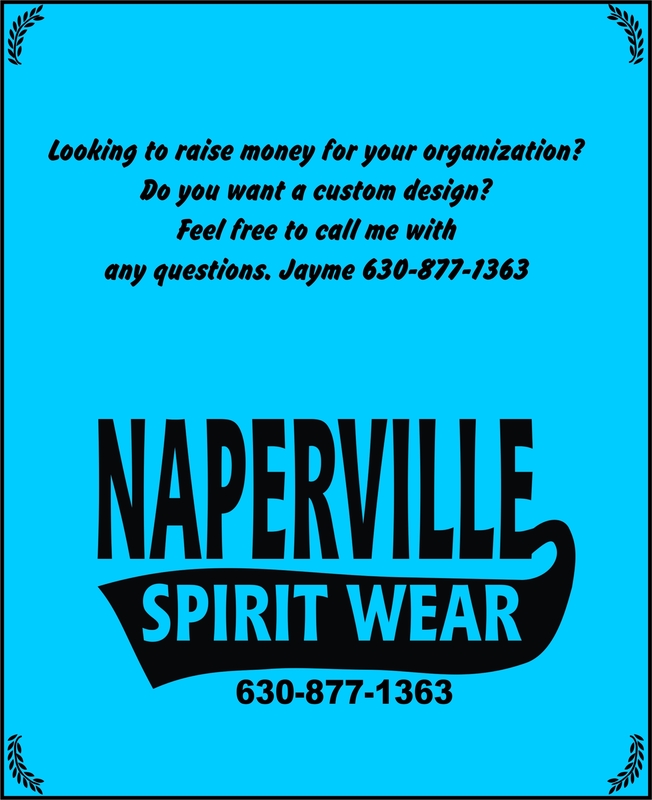 ALL DESIGNS ON THIS WEBSITE ARE THE SOLE PROPERTY OF NAPERVILLE SPIRIT WEAR, ANY ATTEMPT TO COPY AND RESELL WILL RESULT IN LEGAL ACTION.